Members of the Matchbox team have been in Asia recently and I am particularly grateful for their efforts to provide images and answers for this week’s report. All images are provided by kind permission of Mattel. 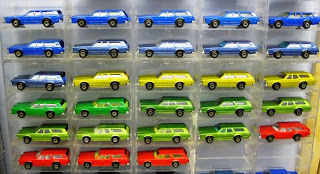 as MAJORETTE,WELLY to see how they put together/design their castings? 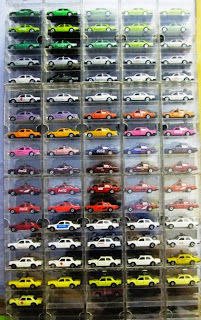 I ask this because its really amazing/baffling for many that such brands can be licenced, diecast body cars and trucks with opening parts at lower or similar price to Mbx produced in the same countries as Matchbox. The Matchbox team does keep tabs on what our competitors are making and vice versa. 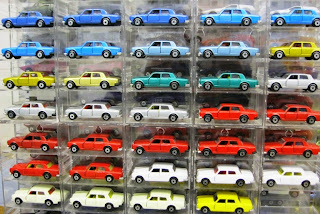 The retail price is dictated by many factors around the world and can indeed be baffling to some. 2. That Porsche Boxster is drool-worthy. But of course, it must be a 9/10-pack exclusive, which means I cannot afford it. At least I can admire it online. 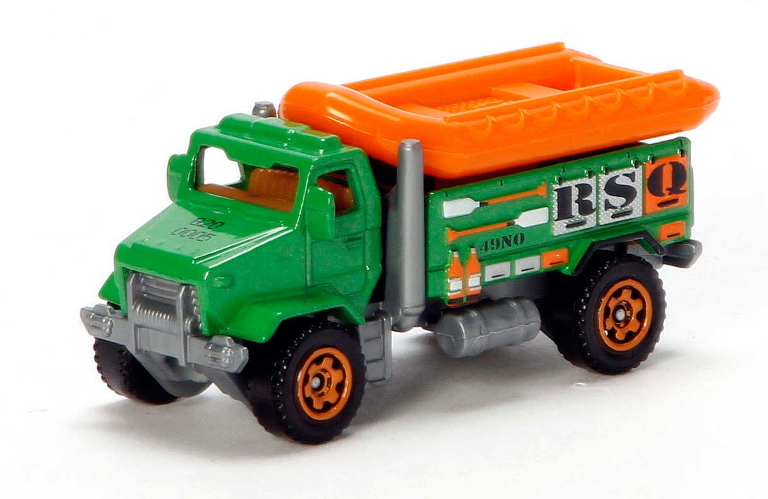 I do love how Matchbox is digging into archives (with this, the Z8, and Frogster) and giving these old models a fresh-look; I would love to see this happening in the mainline. This looks to be one of the best Boxsters done! The Team really does have a talent, and sometimes corporate lets them show it. Thanks for the compliment. We appreciate it. 3. The Snow Ripper looks nice, but why are the handlebars so low? They looked smashed down into the front. Based on the upright seating position, surely this was a mistake? Whatever the case, it looks really wrong. A rider would have to lean into those handlebars, but the seat is too high and straight-up! Would you please comment? Sorry that you don’t think our design makes sense. It is after all a toy and a creation from the team’s fertile imagination. Since it isn’t made for real people and real human engineering is not required we did take some artistic license. The Snow Ripper is fantasy model so how you interact with it is up to your imagination. 4. Snow Ripper: I like the concept of a snow mobile. I like the colors and graphics. But can you realistically drive that thing - with your hands and not your feet. And can you realistically bring a friend along? I'll have to wait and see the actual model to be able to answer that question. See the answer number 4 to solve the mystery. Cheers. 5. So far the only good stuff in my opinion from Matchbox has been the Black DBS Volante, red Seagrave fire engine, and Exotic 5 pack. The Panamera deserves an honorable mention. 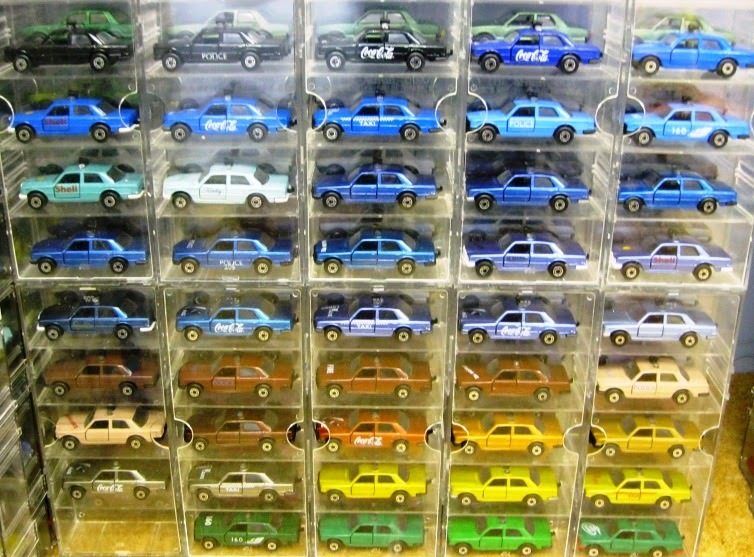 My only complaint: the fixed roof cars have no side windows - a common Matchbox trait. I hate cars with no side windows. It's just my thing. 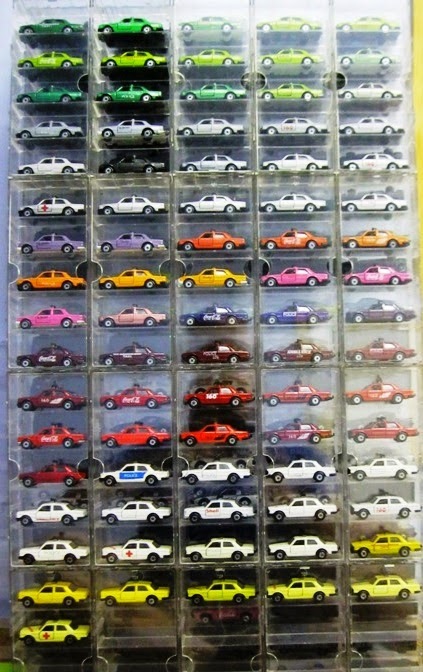 I like sealed, closed cars. I don't want dust and other particles getting into the car. It becomes unreachable, unless you're a custom maker and you can take it apart. Last year's terrific BMW 1M was an exception, and I made the same exception for the TVR Tuscan S(in 2005 I think) and this year's Exotic 5 pack. 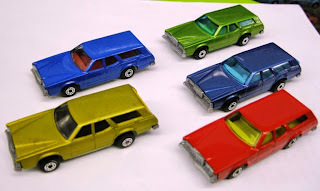 Solely because Matchbox usually has much better detailing than Hot Wheels and the headlight/taillight tampos are very precisely done. But I need side windows! We generally prefer not to have side windows. 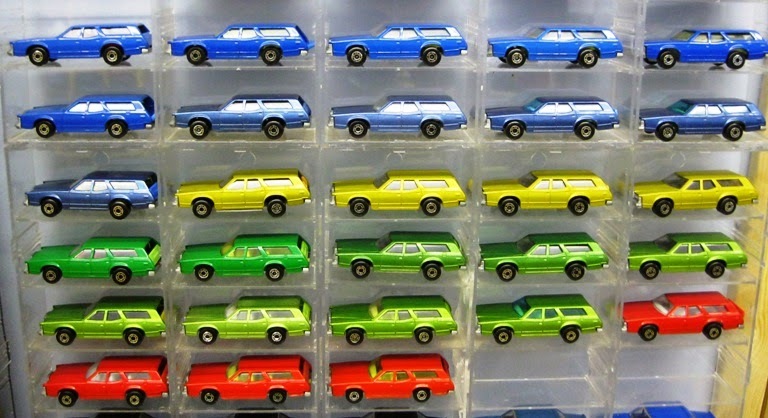 At 1:64 scale sealed windows often obscure the interior details due to the thickness of the window glass. We prefer to look inside. Sometimes there are surprises inside that would go unnoticed if the windows were rolled up. 7. Could the Land Rover Defender be retooled to have the entire grille and headlight assembly to be part of the base or interior? There are four new 2014 tools to show this week. The new Rapids Rescue vehicle has a removable raft on top. 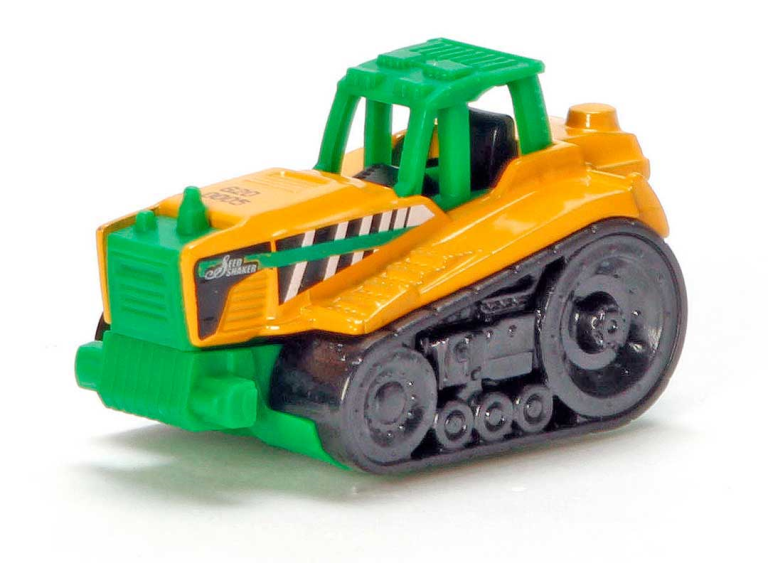 Next we have the Seed Shaker which is a tracked tractor. 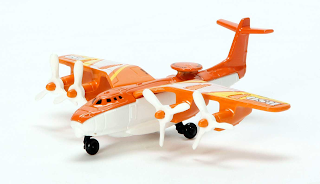 Next we have a new Sky Buster Plane called the Sky Sentry. This new item is for our 2014 Creature Catcher line. This is one of 4 vehicles, two of which will be aircraft based. 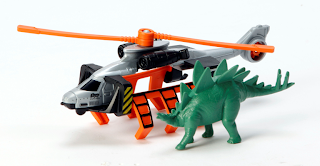 It will come with a Dino which can be captured with the retractable claws. The Mercedes 450SEL was available in a medium or deep metallic blue with opening doors, a silver plated base and a light or dark beige interior. Interestingly, another Mercedes 450SEL was planned to be released as a taxi at No. 54 at the same time. This would obviously save on manufacturing costs as only a TAXI sign would need to be added to the roof. 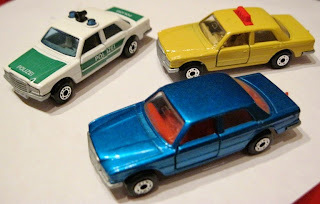 However, the idea was dropped, possibly because the 450SEL was a luxury vehicle which would not have usually been found in the guise of a taxi. Nevertheless, two years later in 1981 the idea was reconsidered and this time the saloon was replaced by a taxi in German livery with a red plastic “Taxi” sign protruding from the roof, with authentic light beige paintwork. The light blue and yellow versions shown here are colour trial models. 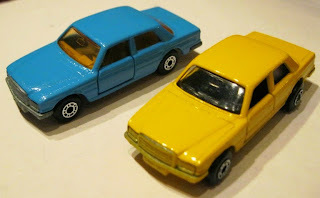 The pocket catalogue shows a pre-production model, with yellow interior and amber windows, which to some was superior in appearance to the actual released model. Cross hatching on the base of several models was introduced to allow the metal to run more freely during the casting process. A very small run of the first issue of this Mercedes escaped the factory with smooth base plates without the “hatching” of all later issues. It is sometimes considered to be a pre-production model, though a tiny handful was found boxed in stores. This was a very attractive looking piece, further enhanced as many came with silver grey painted bases. Despite this colour change, it was decided for the USA to delete the model from the range and replace it after just three years with the Peterbilt Milk Tanker! It survived elsewhere and in 1983 was converted yet again, this time into a Mercedes Police Car with German lettering! 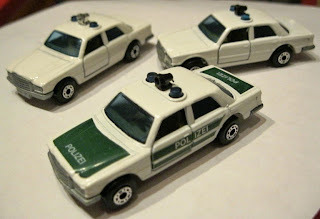 A horn (in chrome and later black) and roof lights replaced the Taxi sign and the body was now in white with green panels and “Polizei” tampo print. Again the base could be plated or be silver painted and the windows were changed to blue, although this did not really complement the beige interior, which should have perhaps been re-coloured to white. The shade of green tampo varies considerably from a pale green to bright mid green, dark green to a very dark green, so dark on some models in fact that it appears almost black! 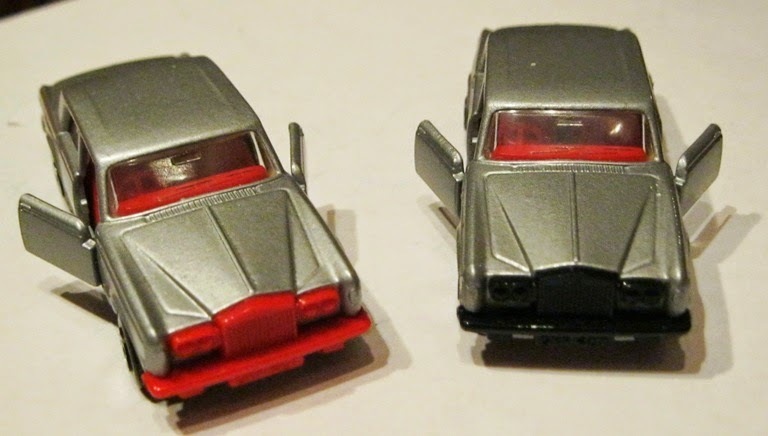 A small run with the chrome horn was released with no tampo print whatsoever - an unmarked police car perhaps! 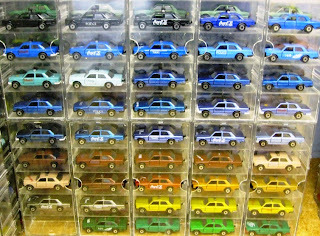 Even rarer than this however are examples which appeared with the tampo missing only from the side panels. Such examples are very hard to come by. The Mercedes was deleted in 1985, shortly after the last examples had been made in Macau. However, it was yet another model that was used in Bulgaria and produced in a huge variety of colours – some of which were very attractive. You may love or hate the Bulgarian issues, but there is no denying that some colour schemes would not have looked out of place in the miniature range. Another USA themed model released in 1979 (in addition to the Lincoln at #28) was the #74 Mercury Cougar Villager. An attractive pre-production model appears in the USA trade catalogue in pale yellow with a beige interior, but in fact the #74 was instead released in a pale green with a pale yellow interior, a plated base and a green plastic drop-down hatch at the rear. This white version is a pre-production. 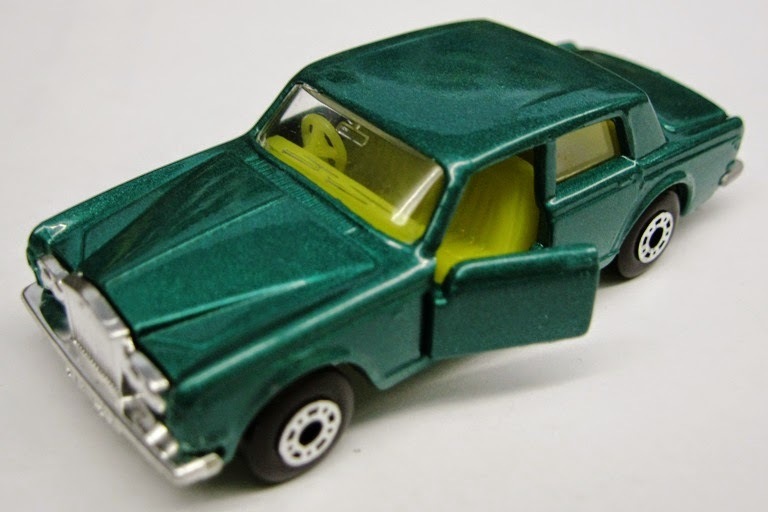 In this metallic green colour it bore more than a passing resemblance to the Mercury Commuter, which had been deleted just five years earlier and was positioned at almost the same number: 73! The Cougar model could also be found with a much darker yellow/orange interior and also the body shade could be a much darker shade of green. A further difference was the replacement of the dog looking over the tailgate to a drop-down plastic tailgate in a similar colour to the body. In 1981 the model was revamped in an attractive deep blue shade with matching hatch. It also came with the light or dark yellow interiors, but there are alas no other major variations on this model. Sadly it suffered the same fate as the Lincoln and was deleted in 1982 after just three years in the range, replaced by the Fiat Abarth in the UK and the Orange Peel (Dodge Dragster) in the USA. It was produced in Bulgaria for a very short time and in comparatively few colours as shown. I have no idea why it was so short-lived. The #39 Rolls Royce Silver Shadow at first glance appeared to have been brought out of retirement, so similar was it to the regular wheel #24 from 1966 which had remained in the range until 1972, having been converted to Superfast in 1970. 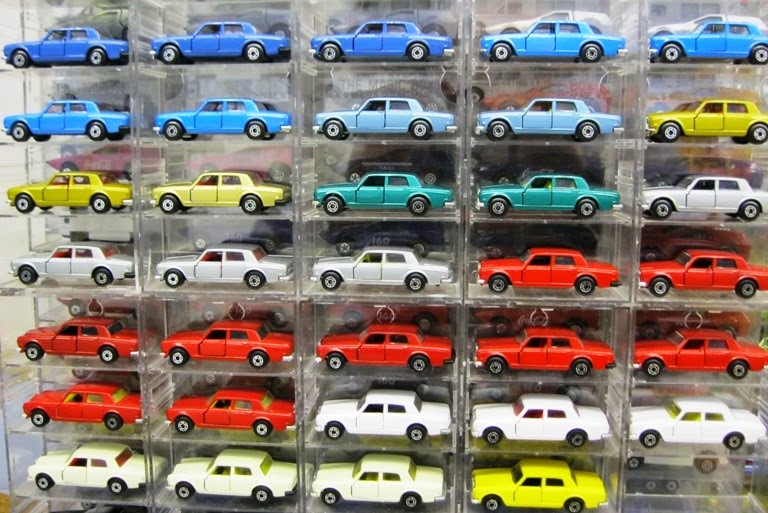 It originally reappeared in 1977 in gold as a Japanese release and then in 1979 in MP-1 packs with dot dash wheels replacing the 5 spoke variety. The #39 also has the dot dash wheel, though it is in point of fact it is a different casting, with opening doors instead of an opening boot, a chrome plastic instead of a metal grille and a different base plate, but the body itself appears virtually unaltered. In the standard catalogue it is shown in a beautiful rich reddish-bronze shade with a cream interior, but in the USA trade catalogue it appears as it was released, in silver with a red interior. In 1981 it was re-coloured in metallic red. The interior was now cream, so it was quite similar to the pre-production model in bronze, though possibly not as stunning! This red model can also be found with a light yellow or brown interior, though these are quite hard to track down. The two silver models shown have pre-production front grilles. This colour was then withdrawn in favour of a champagne gold shade in 1982, now with a white interior. It can be found also in a standard gold shade but this is rare. The base can be found sprayed silver on about 20% of the gold variants. Even rarer are those models with amber windows, but the rarest gold model to be found is one with narrow 5 arch wheels, which must have been an extremely short run as it is barely seen. 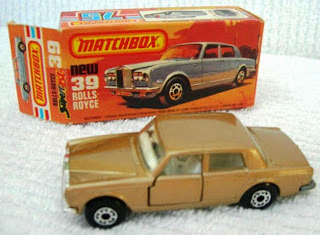 In 1984 the Rolls Royce was re-coloured in an attractive dark red shade known by collectors as plum! The interior was white, the base plated or painted silver or occasionally in black, which is quite a desirable piece. The mould was then transferred to Macau where the last run of these models were made with pearly silver bases, until the model’s deletion in 1985. The contract with Bulgaria to supply die-casting machines was also agreed with Hungary. The agreement lasted less than a year and though some moulds had been passed on from Bulgaria, several new models were produced for the first time. 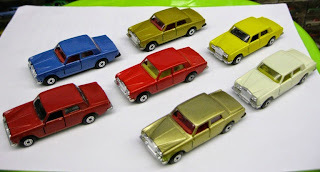 One of these was the MB39 Rolls Royce Silver Cloud. 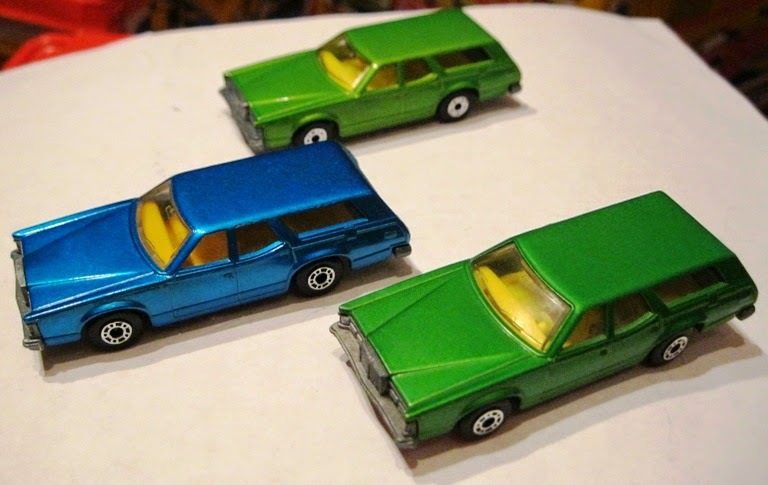 For some reason only a few models were made and they were never easy to find. There has always been a premium with these Rolls Royces. The metallic green version to me is particularly appealing. Again I am indebted to Graham Tomlinson for his help in the compilation of this article. I am happy to look in depth at any Matchbox miniature from the 20th century, though my knowledge of this century is very thin and examples of prototypes are unavailable.